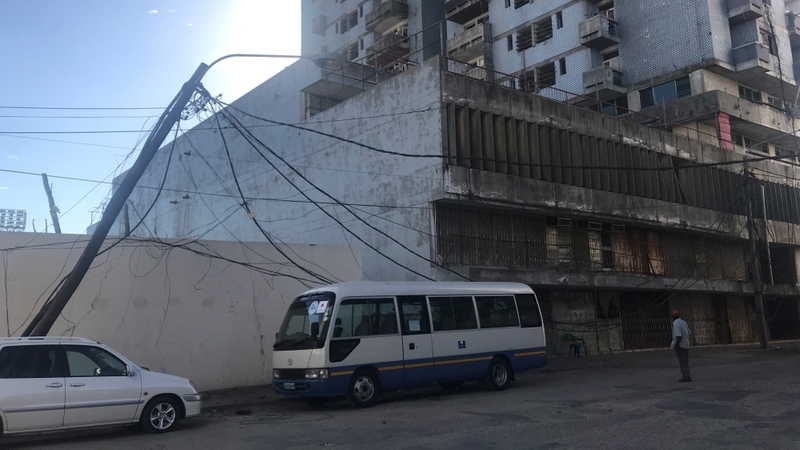 Beira, Mozambique – Ripped off rooftops, lacerated power cables and makeshift mounds of sand dot the streets of Beira. The port city on Mozambique’s central coast bore the brunt of Cyclone Idai which made landfall on March 14, bringing torrential rain, heavy winds and provoking widespread flooding in parts of southeastern Africa. Now, more than three weeks after the storm battered Mozambique, Malawi, Zimbabwe and Madagascar, killing hundreds and displacing hundreds of thousands, Beira has become a major hub for the coordination of the Mozambican aid efforts, prompting its pre-Idai population of approximately 500,000 to proliferate quickly. Thousands of people forced from their homes have found shelter in Beira’s makeshift relief camps, set up by the government and run by humanitarian groups. Arrivals are only projected to increase as relief agencies reach affected villages that were previously inaccessible, but camp facilities are already overstretched and some people are already struggling to find a space in which to recuperate. In recent days, humanitarian efforts have focused on containing an outbreak of cholera that has affected some 2,000 people. Health officials have launch a mass vaccination campaign, while humanitarian organisations have been distributing hygiene kits to prevent the spread of the bacterial disease. Beira had infrastructural challenges before it was hit by Idai, including poorly maintained public buildings as well as roads filled with pot holes and littered with rubbish. The storm drastically worsened the pre-existing problems, however, destroyingan estimated 90 percent of the city. As a result, power cuts have become more frequent due to the destruction of vital cables, meaning internet services are erratic and residents often endure several hours of wait to get online. Some businesses, meanwhile, have been forced to temporarily halt operations while they carry out repair work on damaged property. Samilo Anifo runs an event centre which was partially destroyed by the storm – its roofs were ripped clean off, while some parts of the complex collapsed entirely. “We had bookings for weddings, parties and some religious events. We’ve not been able to host any of the programmes because, as you can see, we have to rebuild some parts of the compound,” Anifo told Al Jazeera. “I am using money I have saved for several months to pay for the rebuilding. The government can’t do it for me. I have to continue my business as soon as possible,” he said. Located in Sofala province, Beira is the commercial nerve centre of Mozambique’s central region. The city, however, is considered a stronghold of the opposition Renamo party, prompting some to argue that it has been deliberately neglected by the country’s ruling-Frelimo party. “Nothing works here and the government doesn’t care,” said a man who simply identified himself as Miguel. “If not for the humanitarian organisations that quickly came to our rescue, more people would have died. The government has not shown any serious concern because we don’t support President Filipe Nyusi,” Miguel told Al Jazeera. Nyusi visited Beira shortly after Cyclone Idai made a landfall, promising to assist displaced people and provide seeds for farmers. Many in Beira’s sprawling camps face an uphill battle in their attempt to rebuild their lives post-Idai, including a looming food crisis. Rural communities have been particularly hit, as an estimated 700,000 hectares of crops has been lost in central Mozambique as a result of widespread flooding and heavy winds in the wake of Idai. A number of those who have arrived in the city from neighbouring villages suffered double losses, with the storm wiping away both their homes and sources of livelihood. And even if their modest houses are still standing, they may require major rebuilding work once the flood waters recede. “I am happy that am alive,” said Esther Zalimba, who is from Buzi, a storm-hit village southwest of Beira.